Quick sketch of a rose called "New Face"
Our wet spring weather has been a real boon to the roses and we have had a spectacular showing this year. A recent visit to the San Jose Heritage Rose Garden was a real pleasure, even though a lot of the roses were past their best. What I learned - roses are darned hard to paint! The watercolor plein air group visited a wonderful hilltop iris garden with gorgeous views and a riot of color in every direction. Absolutely beautiful! Welcome to the first plein air paintsite of the year - may there be many more! Weather was cool, but sunny -hooray! The sketch above was done in the gardens of the Casa Grande, which is now the New Almaden Quicksilver Mining Museum. What remains of the old water tower is on the left. This second sketch is of part of the back of the Casa Grande. A quick painting before lunch, so no time to do the whole house! The original house was built in 1854, and is the second oldest building in Santa Clara County. Sadly, the museum is not open on Thursdays, so we couldn't go inside. I'd like to come back another day and look at the machinery etc. I seldom paint abstractly, which is a shame because I do like abstracts and I love painting in a purely intuitive way which lends itself to creating abstracts. Anyway, here is a recent abstract painting. Acrylic on illustration board. I started out with a few blobs of acrylic paint and a vague idea that I was going to paint mineral accretions based on a photo I took in New Zealand. The painting went in a different way eventually. See what your imagination makes of it! This is the initial scraping of acrylic paint with a few additions of color glazes. How to ruin a beautiful watercolor! So, I learned a valuable lesson this week. First there was that joyous feeling you get when you have completed a successful full sheet watercolor. I painted wet in wet and there is always a frisson of excitement as the colors bleed and mingle and do wonderful stuff on the wet paper. As it dried I was patting myself on the back when- SHOCK, HORROR! Strange lines started to appear in my painting. It suddenly dawned on me that I had done a stupid thing. I had wet my paper and put it on a large sheet of cardboard to do the painting. The lines were from the corrugated cardboard. Ugh! Well, that was a good painting ruined. I had a second attempt at the painting - sans cardboard this time, but of course no two watercolors ever come out the same no matter what you do…! Today started out at bit chilly (by California standards anyway!) but was gloriously sunny. Having painted the Ainsley House many times before, Jenny and I wandered down to Campbell's signature water tower on South 1st Street where we blocked the sidewalk with our painting gear in order to get the best view! Then, back to the historic Ainsley House for lunch and another little painting. I'm painting wet in wet most of the time and I was even able to do some scraping out - normally the paint dries so fast you can't do that. Here is my latest doggie portrait, a Boston Terrier called Tyson. This one was for my contractor. Sadly Tyson met with an accident just after this portrait was commissioned and is no longer with us. Take care of your pooches and treasure them every day, they bring such joy. The owners generously allowed us to enjoy their property for the day and make some wonderful paintings. What a lovely setting, and, of course, perfect Californian weather! I managed to create two paintings I was actually happy with. My secret this time was to think "simplify", and work wet in wet. Sounds easy, but its hard to remember what to do sometimes when you are busy admiring the puppies and ducks, and looking at the gorgeous colors.....etc. Painting en plein aire is just too much fun! He had a grin like a cheshire cat all day and thoroughly enjoyed himself! I was able to spend some time sketching the engines, riding the train, and even relaxing among the redwoods. A wonderful day all round! Martial Cottle Park is newly opened in South San Jose. Surrounded by housing, it is the last surviving relic of agricultural heritage in that area. They have kept the beautiful old oaks and make a cute children playground. This piggy was a little sit on sculpture in the children' park. Playing with the scale of the landscape made him into a giant pig! We had a lovely day at the beach the other week. Our hosts have delightful cabins at Martins Beach, near Half Moon Bay, and we were invited to paint from their decks. The day was warm, but foggy, and a very welcome change from the sweltering heat of San Jose. I believe there was a massive rock just off shore as some of our members painted it, but the fog kept it hidden from me! This week's plein air adventure took place in an artists' garden. Anna invites us every year, and every year there is something new to see and paint. Her garden is an amazing collection of plants and objects. Below are a couple of my past paintings. This is from last weeks' visit to the Japanese Friendship Garden in San Jose. A wonderful little park between the Historical museum and Happy Hollow Zoo. The geese were everywhere tho - so we had to set up with care to avoid their mess! Despite the poo, it has beautiful trees, ponds and rushing streams - very pleasant in this hot weather. The geese don't stay still, so these are quick gesture paintings drawn with the brush and watercolor. Today we had a hike and sketch and paintsite at Pichetti Winery. A few hardy hikers took off in the blazing sun for a short walk. Fortunately we found a couple of shady spots to paint from, before a strenuous hike up a very steep hill! We had a bit of a workout both with the painting and walking! The sketchbook painting above was done at the first stopping point. I just finished this painting based on photos from my visit to England back in March this year. We had a day riding trains along a steam rail route near Leicester. The quaint little stations along the way were decked out in posters and memorabilia from the past. These red phone boxes were everywhere when I was growing up in England - now in the age of mobile phones the phone box is anachronistic! This painting is acrylic on canvas, 30 x 15 inches. Yesterday the plein air group had a wonderful hike and sketch at Santa Teresa Park. There are lots of wonderful views, and the route was such that it felt like a real hike in the wilderness. It was a pretty windy day, so the temperature stayed very moderate despite the sun. Perfect in every way and lots of ideas for future paintings! So, finally, the finished portrait of Wallace. I was very happy with my original color study in oil pastel, but decided to go with my original idea of painting Wallace in acrylic. I am pleased I did, because it came out even better than my pastel. This one will be varnished and shipped off to my niece for her birthday. I'm working on a pet portrait for my niece and had resolved to do an acrylic painting on canvas. However, while I was waiting for the gesso to dry I decided to try out my oil pastels by doing a color study. This turned out to be a lot of fun and I am so pleased with the results. I have had the oil pastels in my studio for years - waiting for the right subject to come along. And here he is! I've been traveling and neglected my blog! I didn't get time for painting on my recent trip to England, but I was inspired by some of the places we visited. Here is my first painting in what I hope will be a series of English scenes. This is my interpretation of Dartmoor. When we were there it was pretty cold, windy and overcast. I exaggerated the colors of the sky in my painting. I painted in acrylics on a piece of 32" square Arches artboard. This is a watercolor paper surface so I did some wet in wet acrylic painting to begin. The sky was completely done wet in wet and then left alone. I used a lot of dry brush to suggest texture on the land, and I added some oil pastel to the foreground, just for fun. 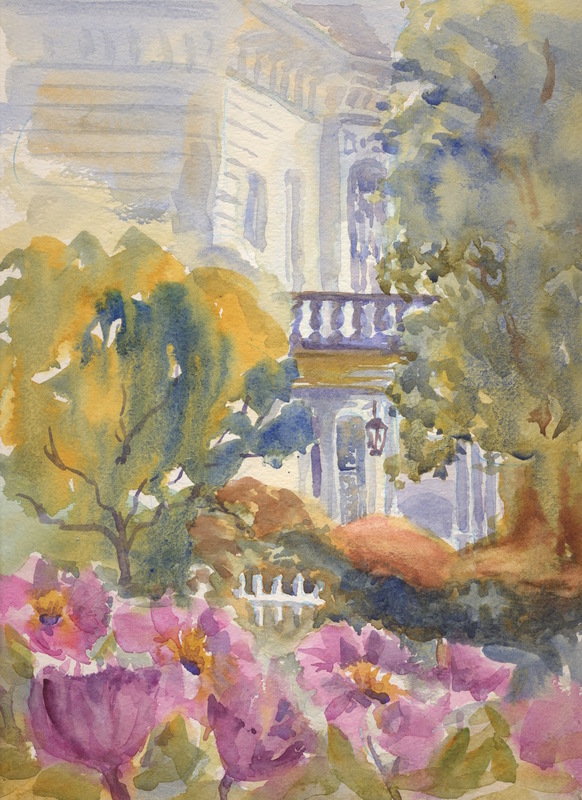 Santa Clara Valley Watercolor plein air group visited the Kirk Farrington House in San Jose today. We were particularly excited to paint the tree peonies in the garden. I love the architecture of these old houses, with their tall windows, columns and balustrades. I don't have the patience to paint it all though, so I wanted to do a bit of a "peep through the foliage" view! I also wanted some suggestion of peonies in the foreground. This sketch came out ok, needs some stronger darks I think, so I may work from it and do another version. The peony below was drawn and then largely painted from memory as I had to move into the shade. This Saturday, March 21st, I will be at the Saratoga Blossom Festival, 9:30 - 4 pm. Stop by my table in the Heritage Orchard and say hi! The artwork on this site is protected under copyright laws and may not be reproduced in any manner. Please respect the work of the artist. Thank you. I have been plein air painting in the Bay area since 1994 and love the challenge of painting outdoors. I paint in watercolor and acrylic and love to draw in pen or pencil. Pleinairmuse is my old blog, you can see many of my past plein air sketches there.